“CashewSnack” by User Femto on en.wikipedia – Femto. Licensed under CC BY-SA 3.0 via Commons. It has been a while since we’ve done a food feature. During this Holiday season, nuts are favorite gifts, cocktail snacks at parties, and ingredients in all kinds of festive recipes. So, this week let’s look at the cashew nut. Did you know that cashews are only sold without their shells? The inside of the cashew shell contains a corrosive resin that is harmful to eat, so the cashew ‘apple’ has to be heat processed (roasted) before the nut is removed and edible. The resin contained inside the shell is used to make varnishes and insecticides. “Cashew apples” by Abhishek Jacob – Own work. Licensed under CC BY-SA 3.0 via Commons. 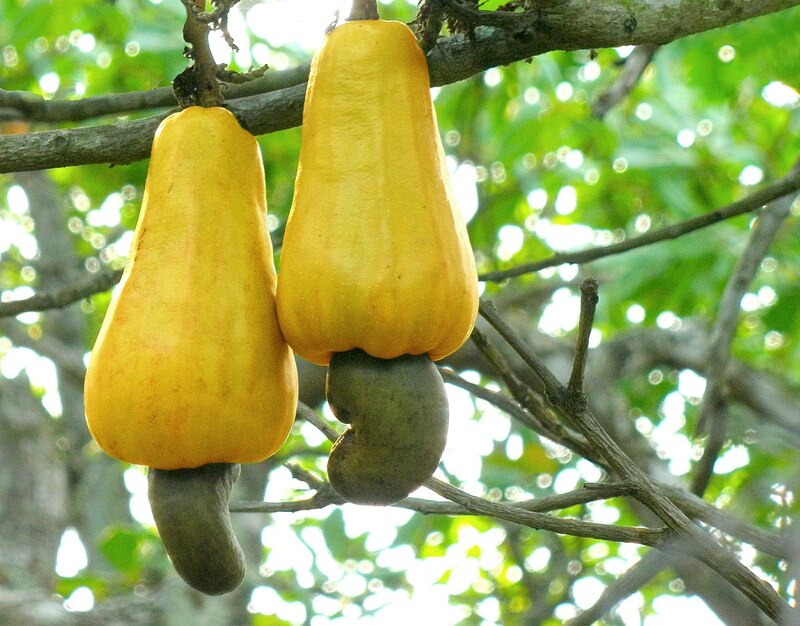 The cashew apple tree is native to Brazil. Cashew nuts are grown commercially in Brazil, India, Vietnam and some African countries. Like many other nuts, cashews are high in calories. They pack a lot of energy with about 220 calories for 1/4 cup (40 grams). A large part of the calories are from fat and the most abundant fat is monounsaturated, oleic acid. It’s the good kind of fat that helps to lower LDL-cholesterol and raise HDL-cholesterol, thereby being heart healthy. A good source of phosphorus, manganese, magnesium, and zinc. Nuts in general are very high in antioxidants and therefore are considered heart healthy. Several studies have shown that including nuts as part of a regular diet has benefits in reducing the risk of cardiovascular and coronary heart disease. 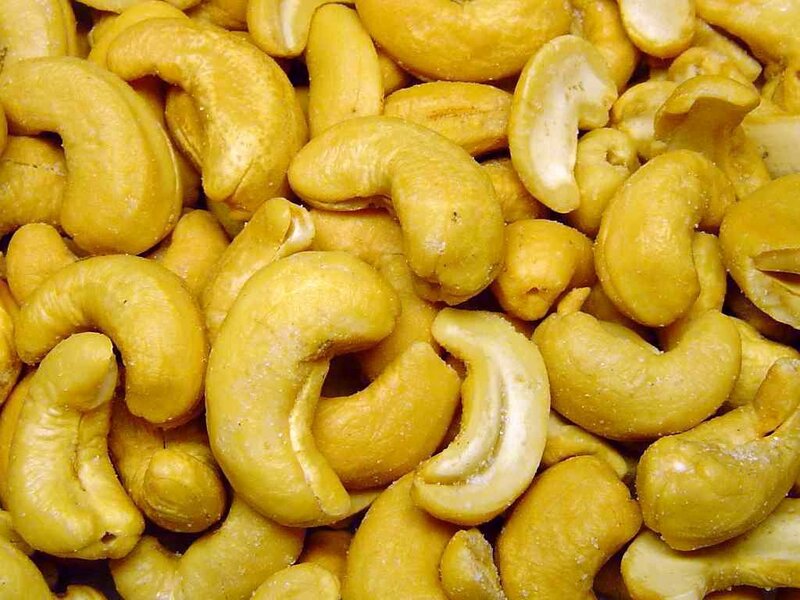 In addition, there are bone health benefits to cashews, related to its high magnesium content. Copper also contributes to bone and connective tissue development, along with supporting other physiological processes such as use of iron, production of skin and hair pigment, and elimination of free radicals. Cashews are great in both sweet and savory dishes. These nuts can be simply added to dishes such as salads and stir frys or used as a main ingredient. Cashews are often used as a substitute for dairy so there are tons of vegan recipes with this wonderful nut. One of our favorite food bloggers, Minimalist Baker, has used cashews to make cheesecake, mac’n cheese, vegan parmesan cheese, ice cream and so much more. Check out a sampling of her cashew-based recipes here. This Holiday season is all about dessert so, let’s start our feature recipes with a light and tasty cashew cream parfait. Be sure to also try our original recipe of the week, Cashew Bites. Fresh fruit and cashew cream make for a great, light tasting dessert. Indian-inspired dish packed with nutritious nuts, spices, and greens. The next time you are feeling the munchies, try a handful of cashew nuts. They are satisfying, healthy and delicious. This entry was posted in Recipes, Weekly Blogs and tagged benefits of nuts, cashew power, cashews, holiday recipes, nut recipes. Bookmark the permalink.